The conference included sessions on the future of India's urban growth, valuation in the Indian context, implementing effective corporate governance, and successfully building India's infrastructure, accompanied by discussions of business and policy issues critical to the nation's future economic growth. This in-depth panel and audience discussion led by Aswath Damodaran, Kerschner Family Chair in Finance Education, focused on corporate valuation in India, what’s different about valuing Indian companies, and some of the challenges unique to the country’s business and market environment. 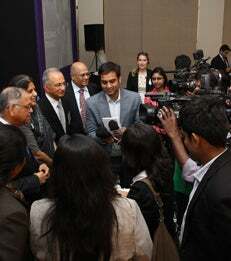 Mihir (Mickey) Doshi (BS '81), Managing Director and Country Head, Credit Suisse Securities (India) Pvt. Ltd. Led by Marti Subrahmanyam, Charles E. Merrill Professor of Finance, Economics and International Business, and featuring thought leaders from industry, government and the media, this session addressed the critical importance of good corporate governance in ensuring continued business evolution and economic growth of and investor confidence in Indian companies. An interactive conversation between UIDAI Chairman Shri Nandan Nilekani and Arun Sundararajan, Associate Professor and NEC Faculty Fellow, with active audience participation, this session addressed the success of India’s massive digital infrastructure investments, their future potential as a catalyst for entrepreneurial growth and economic development, and how their innovative public-private partnership and platform models might facilitate more rapidly building India's physical infrastructure.